I sold a pup the other day. As I was preparing a list of information about commands and housebreaking, I was hit with the reality of just how little the typical buyer knows. I typed three pages and could have gone on for a long time. How to Raise a Puppy You Can Live With is one way to address this problem. While I don't buy every premise in the book (or any other book for that matter) I think its a pretty good attempt at a "puppy primer". Seriously, one can get a bit cerebral with books like The Dog Listener or the Monks of New Skete. Perhaps too much for the first time buyer to comprehend. "Guide the puppy to behave the way you want him from the time you bring him home. Be patient. Behavior development takes time. If you're relaxed and don't turn every act of your puppy into a major battle, you'll find that having a puppy in the house is one of the most delightful experiences you've ever had and that sharing your house with a mature dog that respects you is deeply rewarding"
How to raise a Puppy does touch on some of the dog psychology stuff - like explaining "stress licking" and eye contact. But it is more focused on the dogs development and the basic skills that the dog is expected to learn. This is not a field training manual and does not express the needs of gun dogs in general or spaniels specifically. Of course, there are many books on those topics that have been reviewed in the column. The book also assumes that pup is going to live in the house. 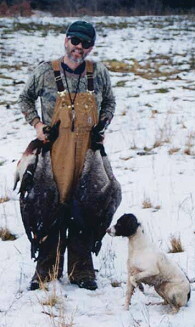 Many gundogs do, and many others are equally comfortable in kennel or house. Although aimed at the novice, there were two interesting nuggets for the experienced breeder or handler. Authors Rutherford and Nell set forth an interesting theory about puppies not bouncing back from fright in the eighth week. Its an interesting theory - especially since many states (at the behest of misguided animal welfare advocates) have set the minimum sale or transport age at eight weeks... exactly during the "fear" period. Perhaps the old gundog breeders who shipped at seven weeks were on to something (even though that makes it hard to CERF at eight weeks). The real jewel in this book was a pleasant surprise at the end - a detailed chapter explaining a puppy temperament testing procedure. While I can't imagine a buyer doing this on an entire litter, it could be a useful tool for the breeder. I suspect that after doing it a few times the observant breeder will come up with the same conclusions that he or she would just observing the pups for seven weeks. And the breeder might want to add some breed specific tests to the procedure, such as reactions to a warm dead bird. Although I was familiar with these tests, I've never seen a scoring sheet. Ask me about this again after a few more litters. How to raise a Puppy is priced low enough to be used as a "give-away" by breeders - something to send home with pup - and seems to fit that need as well as anything. 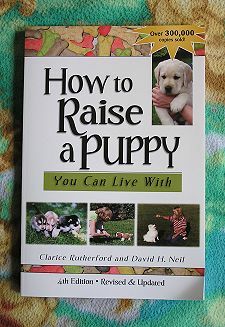 For this cause, and the before-mentioned temperament test, it is a worthwhile book for the library of any breeder.